Donate - Contributions to The Revealtorium are greatly appreciated. The Revelatorium is on the Christ table 'as is'. It is not intended to stir up a dialogue or controversy. Nor is it a doctrine or personal belief. Nor does it represent a new philosophy, religion, or group. Nor is it to be used as fodder for a church. 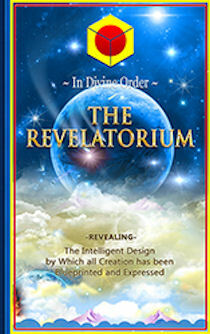 The Revelatorium reveals for the first time ever the entire Intelligent Design of Creation by which all of Creation has been blueprinted and expressed. The information does not come by channelling or illuminations in the form of voices, automatic writings, card props, and other such outer effects of the Outer Consciousness. Channelling is a lesser art, usually from a lesser source, done by telepathy from the outer consciousness of the first to the outer consciousness of the other. Rather, the Revelatorium is a pure Christ Teaching through a Super High Frequency Melchizedek attunement in consciousness for the greatest good for the greatest number. Whereby the information is passed directly from the higher consciousness of the first in a higher dimension to the higher consciousness of the other in a lower dimension. The information is passed directly from the Inner Christ Soul Atom of the one to the Inner Christ Soul Atom of the other as pure thoughts rather than as sentences or phrases. The recipient Christ Soul Atom then passes the thoughts to the outer consciousness aspect of its outer bodily aspect to be translated into the language or communication structures of the local environment, issued out as a new revelation, Christ teaching, or prophecy as the case may be. The author of the Revelatorium is not its creator, merely a party who accepted responsibility in love and service to receive the information and wordsmith it into a form recognizable within your current Earth third dimensional level of consciousness. Which is why you do not see an author trying to sell writing credentials as means for selling the book. In this respect, the Revelatorium is unlike just about every other book on the planet. The Revelatorium is not for profit and is completely unfunded except for the generosity of others plus sales of its Ebook versions and hard copy. Your donation of any amount is very greatly appreciated.